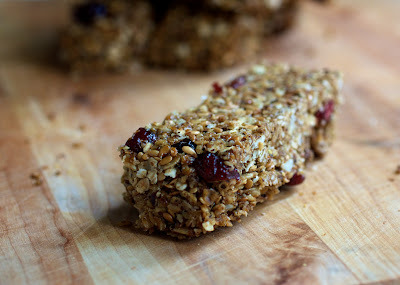 Healthy Granola Bars | Naturally. This summer has been great for me in the motivation department. I have gotten back in the habit of going to the gym every morning before class (ugh… summer school), not eating late night snacks, and not grazing on food throughout the day. One thing I have noticed though is halfway through my first class in the morning, I get really hungry. In the past, I have always turned to granola bars at about 10 a.m. 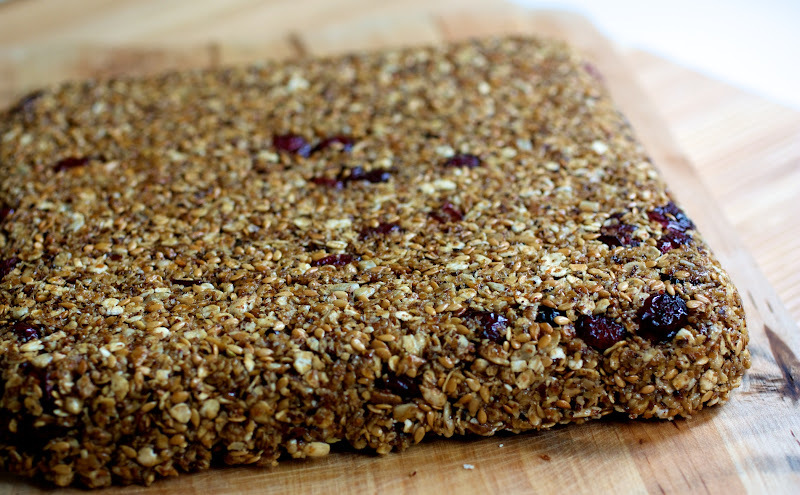 I have a thing about buying granola bars from the store though- they can be really expensive and usually loaded with more sugar and extra ingredients than I need. By making granola bars at home, I am able to cut cost and throw exactly what I want into each batch. This batch has been one of my favorite yet: flax seeds, sunflower seeds, hazelnut meal, wheat germ, honey, and dried cranberries. Healthy, satisfying, and delicious. This recipe is an easy no-bake granola bar that is as easy as toasting the dry ingredients, heating the wet ingredients, mixing together, and letting sit until cool. Not bad, right? Like with most of my recipes, I highly recommend playing around. Got a favorite dried fruit? Throw it in! Want a nuttier flavor? Sub more kinds of nuts. The great thing about these bars is that it is really up to you in which direction you go. My only suggestion is that you stick to the amounts given. 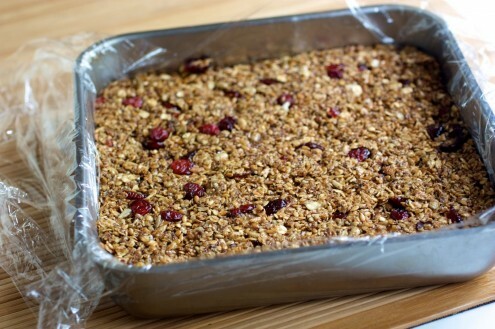 More ingredients + same amount of liquid= crumbly granola bar. These are adapted from Joyful Abode. In the oven or a skillet, toast all the dried ingredients (except fruit) for 12-15 minutes until oats are slightly brown. While dry ingredients are roasting, heat liquid ingredients in a sauce pan until boiling, reduce heat and let simmer until dry ingredients are ready. Combine dried fruit and toasted ingredients. Finally, pour liquid ingredients over oat mixture and stir until every piece is well coated. Line an 8×8 pan with either wax paper or plastic wrap. Scrap mixture into pan and press down so that you have an even layer across the pan. Cover with plastic wrap and let cool (I put them in the refrigerator.) Once cool, flip out of pan and remove plastic wrap. Cut into sizes you would like- I made 10 smaller ones. Hi there, I made this and it came out too sweet for me. How can I make it not too sweet? Also, can I substititute canola oil for bananas? Thanks! sounds great but why would you use canola oil…when coconut oil or hemp oil would be so much better for you? Many of my older recipes call for using oils that I may or may not use now. I agree that coconut oil would be a great substitution that you can make on your own. I don’t change my recipes once they are up on the site. Thanks for the comment! 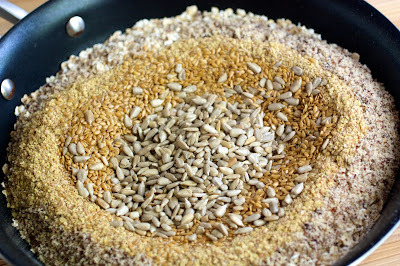 This may be a silly question but is Hazelnut Meal and Hazelnut Flour the same thing? Thanks and can’t wait to make these! Will probably sub the oil for coconut oil but otherwise love the recipe as-is. Hi Dina, My usual distinction between the two is nut flour has been passed through a sieve and is finer than the meal. However, I think in this recipe, you could use either. Hope that helps!